The Deluxe L-Block Shield is designed for managing large quantities of high-energy radionuclides. 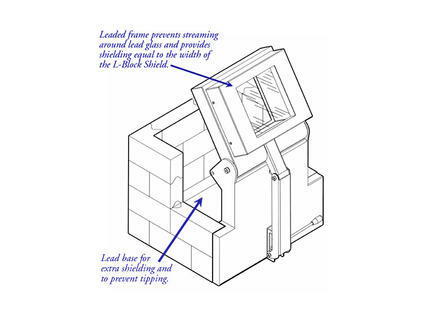 The shield is constructed of 2.4" thick lead encased in steel, and features a large 8" x 8" x 4" lead glass window. A convenient lever allows quick adjustment of window to optimal angle for any user and procedures. The optional 042-417 Lead Brick Cave fits neatly into the sides of the vertical section to provide lateral shielding around the full perimeter of the L-Block's base. A special plate with a hex-shaped recess is mounted on the base to facilitate one-handed loading and unloading of dose pigs incorporating hex-shaped bottoms. one-handed loading and unloading of Biodex PET Pigs.